Veteran journalist and author Joseph C. Goulden offers a good review in the Washington Times of William I. Hitchcock's The Age of Eisenhower: American and the World in the 1950s. Academic historians are giving the presidential performance of Dwight D. Eisenhower a well-deserved second look, and the results show the contemporary political pundits who derided him were either biased or blind to his accomplishments. A 2017 poll of presidential historians ranked Gen. Eisenhower fifth, behind Lincoln, Washington and the two Roosevelts. 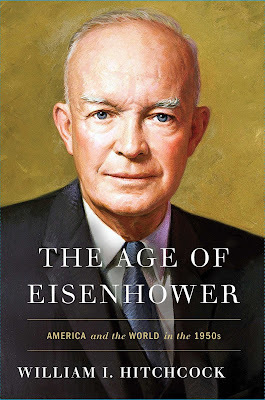 William Hitchcock, of the University of Virginia, spent eight years of meticulous research in newly accessible archives to produce a splendid biography that belies the image of Mr. Eisenhower as a benign do-nothing president who was more interested in golf than governing. Mr. Eisenhower had already achieved fame as the conqueror of Germany, a feat that made him the most popular person in America.